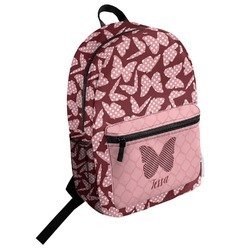 This backpack is the perfect thing for any student or adult that needs one! You can never go wrong with a good backpack. They are useful for school, work, traveling, and so much more! 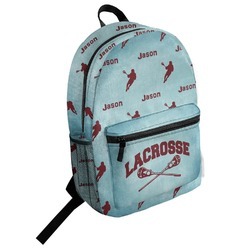 This backpack is the classic style with a zipper pocket on the front and a large zipper opening on top. There is also a small handle on top for hanging or carrying. The backpack straps are adjustable, so they should fit on most people. They are approximately 17"H x 12.5"W x 5"D, which is plenty of room for books, writing utensils, a laptop, and more! On the outside is a mesh pocket that is perfect for a waterbottle. Go into the design center to get the party started! Grab an awesome pattern, graphic, font, and more to combine them into one radical design. You get to choose, so have fun with it! Compare this student backpack to our kids bakcpack to be sure you are getting exactly what you want. We also have a great duffel bag in our luggage and bags section that is worth checking out. We even have a great suitcase as well! Happy designing!